Enjoy Fast, Worry-free Delivery on a Stressless Magic Medium Classic Base with Ottoman. Why not add a functional accessory to your Magic? These include: the ultra-convenient Personal/Laptop Table, the useful Ellipse Table, the stylish Urban Table, or the fan-favorite Elevator Ring set. Magic pricing is reflected automatically when you make your leather selection from the swatches above. Need assistance- Please call 1-888-486-9463. Enjoy Fast, Worry-free Delivery on a Stressless Magic Recliner Medium with Ottoman. Start relaxing in your beautiful new Magic Medium recliner sooner with our Quick and Easy Shipping Methods. It's a great time of year to purchase from the amazingly comfortable, Stressless Magic line! This popular, modern recliner delivers exquisite head, neck and back support and the over-stuffed smooth, soft, cushioning allows you to sit undeterred for many hours on end. The Stressless Magic Medium recliner is among the most modern Stressless recliners available. Now choose from a wide variety of leather and fabric types and colors from the pull down menu above, which is titled: "Select Leather or Fabric Type and Color". Then choose from the beautiful wood stains. Typically, we keep all stains in stock. Want to add a matching Stressless Sofa, Loveseat or Sectional? You’re in luck as there are Ekornes Batick & Paloma Specials available for the Legend Sofa and Love Seat models. These Special Colors will save you $1000’s. Simply choose a matching Batick or Paloma leather sofa or sectional model and watch the savings stack up! Our Nationwide White Glove Delivery means that we will bring your recliner, office chair, sofa or sectional into your home (or office), unpack it, set it up and take the box/packaging with us when we leave. Of course your furniture will arrive fully-assembled and ready to enjoy! *Would you prefer to receive your recliner faster? Choose one of our other speedy delivery methods. Ekornes Stressless Magic Chair Medium with Ottoman. Learn about our Inside Residential or White Glove Delivery! 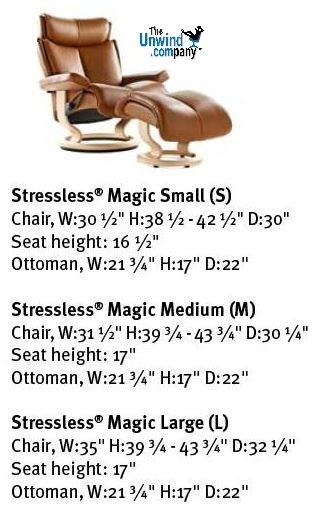 Like its magical larger brother (the Stressless Magic Recliner- Large) the Stressless Magic- Medium, is produced by Ekornes in Norway and is the newest addition to the Stressless Recliner lineup. Once you sit down and let your body sink into the extremely soft cushioning, you'll know that you've reached a level of comfort you could previously only imagine. The Stressless Magic is truly one of the most comfortable recliners ever designed by Ekornes. A magician may never tell his secrets, but Ekornes does! They specifically design almost all of their recliners with a Medium and Large Sized Version. This means that almost everyone can find that perfectly fitting seat for their body. For the Magic Models, Ekornes went a little bit further and made a Small Sized Seat. This extends the opportunity to even more people to find a perfect fit. Check out the measurements of each seat and see which one is perfect for you! Talk about stylish. 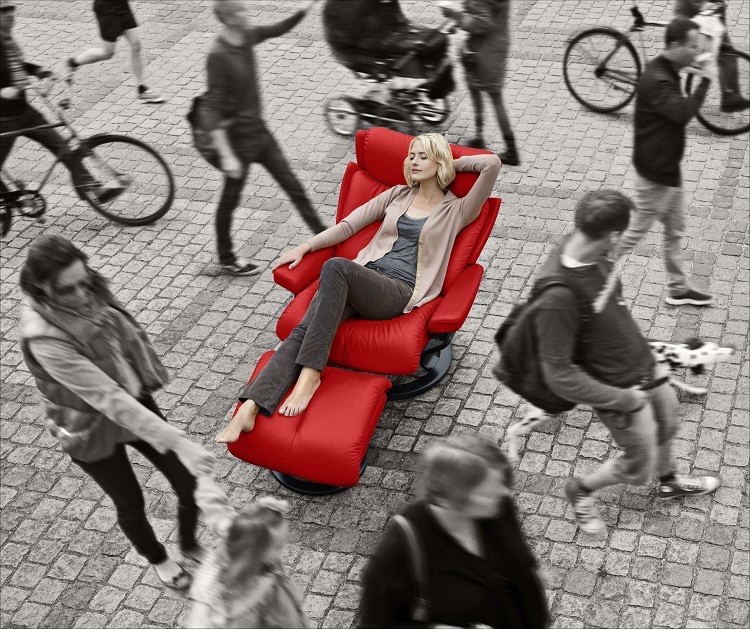 The Stressless Magic looks as great as it feels. The angled back cushion provides overly cushioned support for that lower neck/upper shoulders area where many people carry their stress. The adjustable headrest means you can move the head support higher to support the crown of your head or lower to rest comfortably in the nape of your neck. When you sit down, prop-up your feet and experience true Norwegian comfort, no other recliner will do. It's easily overlooked that the Ekornes Magic Recliner brings home the same back and neck-saving features that all Stressless Recliners and sofas are famous for throughout the world! 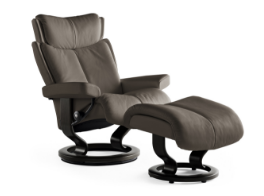 Want to see informative Ekornes Stressless Magic videos? Visit our Ekornes Stressless Magic video channel on YouTube. Or Search and watch 100's of Stressless recliner videos at The Unwind Company YouTube site here. The Ekornes Stressless Magic recliner offers great comfort and support- especially to those who are of average size and weight (warranty is valid for weights up to 350 pounds). SHIPS IN 1 DAY IN: Cherry, Chocolate, Sand, Chili Red, & Light Grey Paloma. SHIPS IN 2-10 DAYS IN: Black & Rock Paloma Leather; Mole Cori Leather; Amarone & Tigereye Royalin Leather. Are you interested in financing your purchase? We have great news. Choose a financing option that will suit your budget and help get you the comfort you need. Our financie companies are terrific, customer oriented and can help you get this ultra-comfortable chair in your home today. No need to wait any longer. - The easily-moved ottoman also features a built-in Tilt System that adjusts to your body movements for the ultimate in comfort. You can't help but notice the extra thick layer of cushioning on the Stressless Magic recliner ottoman. The ottoman also doubles as a soft, separate stool by flipping it upside down and locking the 4 plastic clips. With this much padding on the ottoman, it really does a great job as an independent stool. - Stressless Recliners and Accessories are built to last for many, many years. The unique, round wooden base insures stability and is extremely durable. - Stressless Recliners are always created for a custom fit- Many Stressless recliners come in three sizes (small, medium or large) and many sofas are available in two sizes (medium or large). The Magic Recliner (medium) is comparable to the medium versions of the other Stressless recliner lines (Ekornes Stressless Jazz Medium, Stressless Mayfair, Stressless Blues Medium etc). 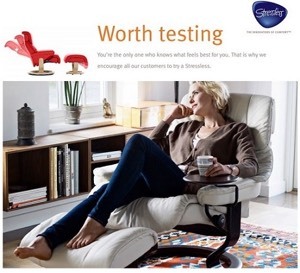 Both the Ekornes Magic Recliners (medium and large) share the same attributes. For best results, take a seat and let us help you determine which size will ultimately offer the most comfort and correct support for your individual body size and weight. We are also able to assist you over the phone if you're too far away to visit. We invite you to grab a book, kick-up your feet and sit in the Ekornes Stressless Magic for a spell- You'll be glad you did- we guarantee it! We have Magic recliners in stock in multiple locations which allows us the ability to ship your recliner extremely fast and have it delivered quickly from coast to coast. The Unwind Company currently offers same-day delivery to almost 70 cities across the United States. Due to the time-sensitivity of our Unwind Express Delivery Service, we are currently unable to process these orders online. Please call 1-888-486-9463 and you can be enjoying your Stressless recliner much faster than you ever imagined. Of course there are some restrictions on this service and sadly, it is not available everywhere. Not in this much of a hurry? We offer many other full-service delivery options as well. A stress-free shopping experience has been our #1 goal since 1997! It is no wonder that Ekornes Magic Recliners are Exclusively Endorsed by the American Chiropractic Association (the ACA). Come visit the Unwind Back & Body Store to experience the Stressless Magic Recliner for yourself. If you have already decided and are ready to purchase, simply click the "Add To Cart" button below after selecting the available options. Please review our return policy prior to ordering or call 888-486-9463 for personal assistance. You may also email stressless@unwind.com anytime- 24 hours, 7 days a week. We've had Mayfair chair for years and really enjoy it. We recently acquired a vacation home and ordered one for there as well. Now we sit in comfort regardless of which home we're at. I do want to put my "Thank you" in writing to you as I do feel that the service we received in the purchase of our Ekornes Stressless chair was superb. My first contact with you was "Customer oriented" with the sending of a catalog and samples to help us in making a decision. The offer to contact you at any time for assistance in our decision making gave me the feeling that you had our best interests in mind and not your desire to just make a sale. From the catalog and samples arriving timely and your effort to help us make a decision was truly an example of what customer service is all about. From the start to the final delivery of our chair the experience has been exceptional and to have total satisfaction when making a substantial purchase is worth the mention of a SPECIAL THANKS! We pondered the purchase of a Stressless Magic for more than a year, primarily because it was a bit more $$ than we originally planned to spend. After receiving delivery (very quickly I should mention) we only wish we had taken the plunge months before. My wife and I really love this recliner and it really is the most comfortable chair we have ever owned. I dumped my old-style Lazy Boy and finally decided to invest in a chair that is built to last. After taking my time (it took me a couple trips to the store) to pick out the model that fits me best, I finally settled in on the Stressless Magic chair. I couldn't be happier. The extra padding and adjustable headrest makes this chair simply "dreamy." I hope this recliner lasts forever!